Kopo is a sound healer. His music is created and performed to create a spiritual and psychological experience for the listening. 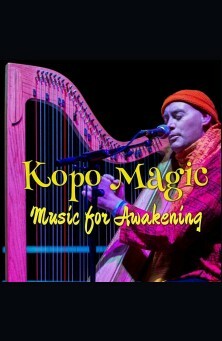 Employing harp, gong, various flutes, tuning forks, bells and many other instruments accompanied with Sanskrit mantra singing, Kopo heals and invigorates his audience. He has been a Music Director at many different Spiritual Centers, including the Salt Lake Center For Spiritual Living. He has performed at the Utah Krishna Temple at the Color Festival, Temple Square at the Tabernacle. For the Praliament of Religions downtown Salt Lake City. He has performed over 1000 sound healing ceremonies forKirtan Concerts, Deeksha, Meditations and Yoga classes.